Soup is something we never get tired of. I often make it in the cold months of winter in Minnesota, but then freeze it in smaller portioned dishes so that we can pull it out through out the several months and enjoy variety in our diet. 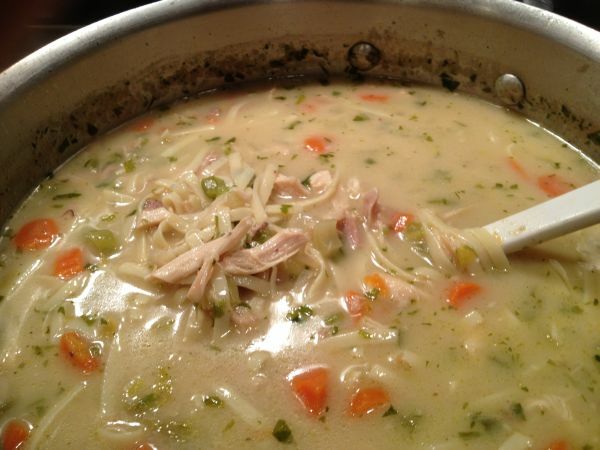 This was the latest version of Chicken Noodle Soup prepared with prepared rotisserie chicken! 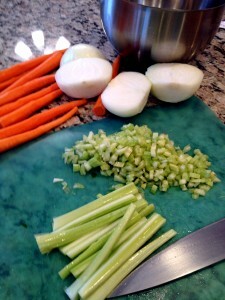 It is an easy to make – thick delicious and healthy soup that even the kids will like! To prepare this easy soup, start by removing all of the meat from the chicken. 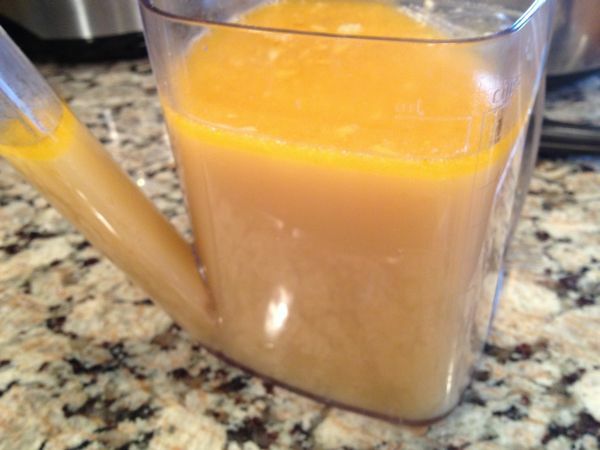 Either make your own chicken stock from the carcass of the bird (or pull some from the freezer that you’ve made in the past) or use water and create your own broth with chicken stock soup starter. Start with your chicken carcass. 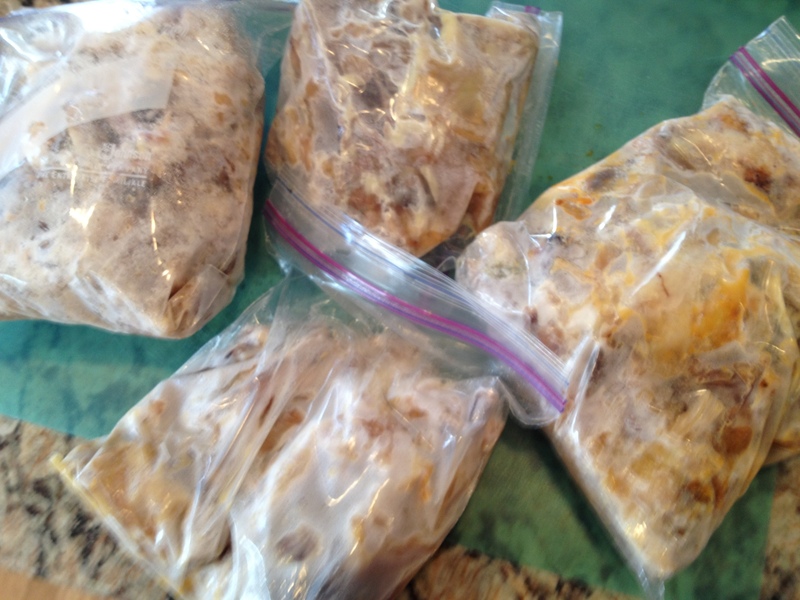 Every time I pick up a broasted chicken and have used the majority of the meat for another dish, I save the carcass, skin and any left over drippings from the take out containers and secure them in ziplock packages for the freezer. 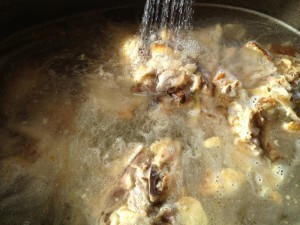 Place chicken carcass in medium-sized pot and just cover with water. After washing all of your vegetables, add all of the onion ends, celery scraps, carrot peelings, etc. Add the bay leaf and continue to simmer for a couple of hours, stirring every so often. While stock is cooking, chop the meat of the chicken s well as the vegetables. 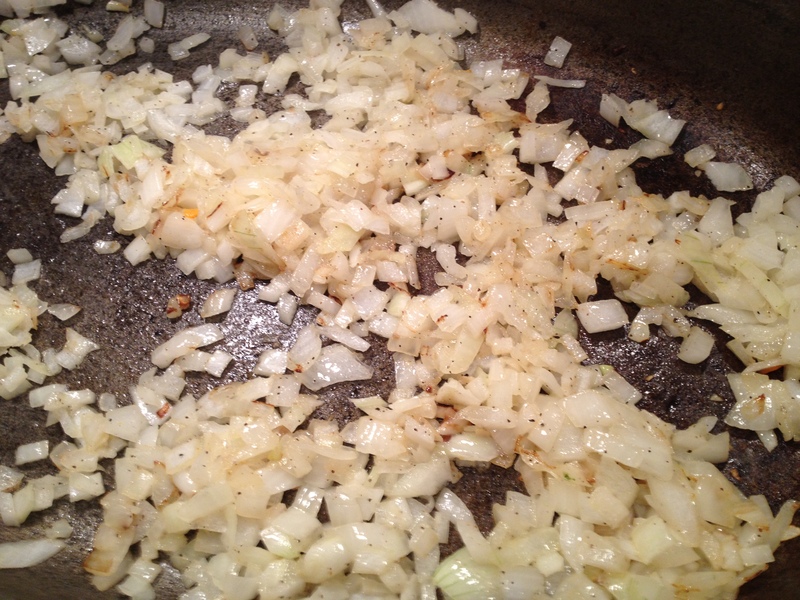 Saute onions in the butter until they begin to become translucent and begin to caramelized. Cook over medium high heat and add the other vegetables cooking them until they soften slightly. After stock has rendered down, run through a strainer discarding the scraps, bones and skin. Only reserving the liquid. Allow to cool slightly. 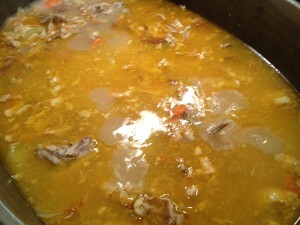 Remove the fat from the broth and return to pot. Combine all other ingredients and cook on low to medium heat until the pasta is cooked to your liking. Roughly about a half an hour or so. To provide a creamier consistency, I added 1/2 Cup of half and half. Add salt & pepper to taste! 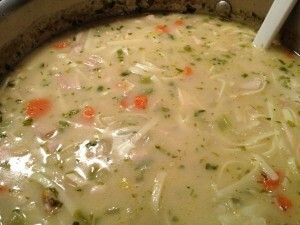 Chicken Noodle Soup is one of my specialties. The recipe I use varies in the way I make it each time. This is my own recipe, never written down, one of those experiments that comes from my head. As with the many of my recipes, I will throw this and that together; a handful of this and several shakes of that. When I do use a recipe, rarely do I follow it completely the way it is written. Thanks for the comment! For years, I didn’t write any recipes down! In fact, I still have to train myself to jot what I’m “throwing” into my current dishes. I started the blog because a number of my friends kept asking me for the recipes of various things I had prepared. A number of them also appreciate the step by step instructions and photo’s because they were never taught how to make some of these simple, but delicious dishes! If I’m understanding you correctly, you make your chicken noodle soup the same as I do, but you’ve never documented what you toss in from what you have on hand?